At the Kevin Haime Golf School we understand that today's juniors are tomorrow's golfers. Our goal for every junior golfer is the same - to help kids learn in a productive but fun environment. Our expert PGA of Canada teaching staff, our world class facilities and our innovative programs will help every junior enjoy their experience with us. For the last 26 years we've worked with countless juniors aged 4 - 18. Whether you're considering one of our always sold out summer camps for an introduction to golf with lots of fun or our intensive High Performance Junior Coaching program to help your junior reach their potential and goals we've got a program for you. Get your kids more passionate about golf and help them play their best with private lessons with one of our team of PGA of Canada Professionals. Private lessons are any golfer's best and quickest way to learn the game. During these lessons your junior will work one-on-one with their coach, practice on our private lesson tee, review high-speed video of their swing and be emailed a voiced movie file for guaranteed understanding. James Parsons with his GAO Provincial U17 championship trophy. At the Kevin Haime Golf School we understand that golf can seem pretty intimidating and difficult to your new junior golfer. With that in mind our expertly trained PGA of Canada professionals will make sure your junior learns in a fun and casual atmosphere. Our pros are expert communicators and have all been working with kids for many years. Our junior summer camps just might be the most popular of all our great junior programs. 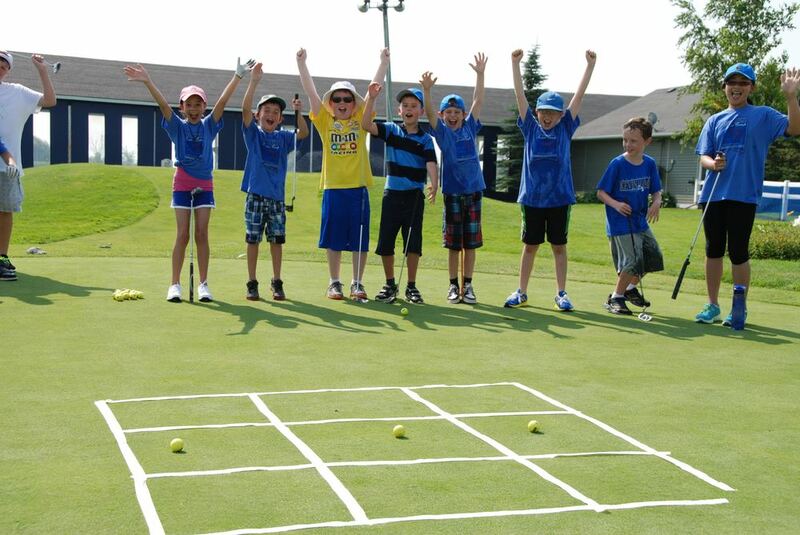 Weekly activities include swing lessons, games, team challenges, skills, tests and drills with lots of fun and laughter mixed In.....all under the supervision of a PGA of Canada Professional. Your kids will experience Golfzilla, Birdie Ball, Snag Golf, and our always popular Short Game Team Challenges. All juniors will be video-taped and emailed a voiced over movie file so they can show off their style! If your junior is serious about the game, our High Performance Elite and Strive for Excellence Coaching Programs could be just the thing for him or her. Over the last several years Kevin and his team of coaches have had great success with aspiring junior golfers. Kevin has coached a National Junior Champion, a few Provincial Champions, a GAO Provincial Team Member and multiple Junior City and District Champions. Our High Performance Coaching Programs are season long plans designed to give your junior everything they need to reach their goals. From equipment fitting and tournament scheduling to on-course lessons and 3D Motion Analysis, this all encompassing program has been built to help junior golfers thrive and succeed. We also have our Early Competitor Coaching Program. This season long plan is designed for the younger junior looking to improve their skills and competition readiness. From equipment fitting and tournament scheduling to on-course lessons and team practices this age appropriate coaching program has been built to set these young competitors up for their best golf. Kevin is passionate about junior golf. He is the 2017 PGA of Canada Junior Leader of the Year and four time PGA of Canada Zone Junior Leader of the Year. He also heads the Kevin Haime Junior Golf Initiative, a program that has granted over 650 memberships to local kids. We believe Kevin's unique blend of playing ability, tournament success and teaching ability position him as a great mentor for young athletes. Talented and motivated young golfers looking to develop their skills and achieve their goals will benefit greatly from our coaching programs. All candidates for our High Performance Junior Coaching Programs will be personally selected by Kevin. For pricing, information or to set up a consult please call Kevin or Lisa at 613-591-0006.